What attracted it to me in those days was dinosaurs....loved 'em, and at that time, people still used the name brontosaurus like it was the only one out there....that and T-rex. These days, I keep revisiting the original film for the love of hand drawn animation, and James Horner's score. I'll always cherish those. I even remember setting up a tape recorder so I could listen to the story of LBT on car trips. B) Good times. Now as for the sequels, there was a time, I didn't mind them. Then again, I was ten when the first one hit store shelves, and then we added the third and fourth to our collection, and that was it. I guess me and my sister never bugged my mom to buy the rest. I saw 5, 6, and all the rest much later, and by then, they were ok, but they became second nature as I had a stronger interest in Jurassic Park and James Gurney's Dinotopia. Do I still watch the sequels? Nope. To this day, I still have no copies of the shows to watch, save of course the theatrical film. Michael Tavera's scores aren't too bad; those I have and listen to them every now and then. Of course these days, I have the Gang of Five to keep me busy, meeting new LBT fans and followers as we come up on the twentieth anniversary of the original film. We can only hope that Universal treats us well. I'm not sure...It's been so long since I remember seeing Land Before Time for the first time. Hey I was only 3 when the movie came out to theatres. Maybe even just 2. So I'm just gonna take a guess here; I was a big dinosaur nut when I was a kid. I still like them today, but I'm not as obsessed today as I was as a kid. My brother Clint saw it when he was 7 or 8, and the sharptooth scared him so much. My dad was upset though because the movie was little over an hour long, and he considered it a waste of money because it was so short. I used to love the sequels as they came out. I kept wanting to rent/buy them as soon as they came out and watch them at home with my sisters, or by myself. My interest started to diminish around the 6th movie because I got sick and tired of those songs they sang. Nowadays I can't stand the singing, so I fastfoward past any song sequence. While I am not as interested in the sequels as I was as a kid, I've made it a tradition to myself to watch any new release of Land Before Time. LBT reminds me of my childhood days, and that's why I continue to watch new movies as they come out. I was born the same year the movie came out to theatres so I only heard of lbt much later. I remember my 3rd grade teacher bringing it to class one day and showing it to us, I was one of the few that were actually interested. I was a dinosaur nut, still am, and hopping to one day become a paleontologist. So during my childhood, movies like Jurassic Park, and "Denver the last dinosaur" were my bible. I first really noticed lbt (eventhough my teacher brought it to class, I kind of just sat there, enjoyed it, and forgot about it the next minute), when I was watching my JP tape that had the trailer in the beggining. I was like, dad, I want to watch that! But he never gave much thought into it. In december 97, the national channel decided to air translated versions of lbt 1,3 and 4 (don't know why they forgot 2). I watched them, taped 4, and just fell in love with the series. I used to watch them every weekend, my tapes ended up all messed up. I used to go to the local library and just rent them, I was always upset because they never had no 2, and that was the only one I hadn't watched. Anyway, I kept waiting for lbt's until no 7, then I lost interess, I used to watch them every once in a while, but I just stoped caring. Had other things on my mind =p After a couple of years, eventhough I was aware that there were lbt 8, 9 and 10, I just ignroed them, 'till one day, I decided this couldn't go on, and my interest come back. It's sort of a love, hate story, where the hate is replaced with misregard =x Anyway, I like lbt and intend to own all of the sequels even if I don't like them, mostly because of the impact lbt had on my life, and it's importance in my childhood. Oh, so we basically tell our story of how we became a fan, starting from the beginning, huh? Okay! Okay, so I am one day watching TV and I see this comercial for The Land Before Time. So as it looking like a good movie and all, I run up to my mom and dad and beg them to let us go see the movie. So we go and see it and I end up enjoying it so much that I wished it would be on video immediately. Impatiently, I wait for Christmas and I get the movie finally. I watched it many times after that, but after several years with no sequal, you eventually stop watching it. LBT 2 finally comes out after several years. However, I do not get it right away. We rent it and watched it. I must say this at least, waiting several years for a sequal was worth it. I then see LBT 3 and own it by it's year's debut Christmas. One of the better earlier ones I must say. Well worth getting in the end. By that time, I'm the only member in my family to actually like it. My brother hardly cared for it, but he was willing to watch it just to pass time when he's bored. I only got to watch LBT 5 by rental and TV airing purposes. Sad to say, I even dropped spending time with family just to watch it. Something I regret nowadays. It seemed that TV and video games were all that mattered to me back then, which is just sad. By LBT 6, I had watched LBT videos far too much and my love for kid shows had nearly died. I forever regret not paying attention to how great it was. As such, it gave me quite the bad image of LBT. For years then, I put myself on a hiatus of watching LBT. I continue to see comericals of upcoming LBT videos, simply wondering how they continue to keep going? I then see LBT 11: The Invasion of the Tinysaurus for sale at Wal*Mart and wonder to myself why I stopped watching it. So I buy it and watch it. My love for the series returns. Determined to see what I missed, I go on a search to find them. Slowly saving up my leftover spending money, I then get LBT 9. I must say, it was the best sequal ever made. The writers had decided to get back to how it all started. Giving us a little major earthquake and have the gang try to get back home. Having yet another dark scene put in that, if I could, would've left me in tears. Continuing to save up money, I get 10 next. I had once called it one of the most misunderstood LBT pieces ever made, but Malte, after somewhat amount of debating, set me pretty much straight. I still hold quite the opinion of how well done the sharptooth battle was, but those were the three worst sharpteeth I had ever seen. Still, it is a good one, and I continue to watch it from time to time. Next came LBT 8 for me. Where I live, this is THE most recurring LBT video to appear on TV. Seriously! : Despite the simple plot involving snow, there is alot to talk about. At that point, I wondered why I even went on hiatus. The last ones were difficult to get. I was only able to get LBT 5 on VHS before it seemed like they would no longer be sold anywhere on VHS. I would've preferred DVD, but meh! What it is that keeps me coming back is hard to say. There's just too many good things about LBT in my book. I could go on an hour long to read list of what good things are in it, but I don't feel like putting that in. So this is where I stand today. Being a loving fan of LBT time, continuing to love the series and buying new things from it until the franchise becomes illeagal. Well, I had to see it on VHS the time I saw it, because I was three when it was in theaters. I was about five when I first saw it on VHS when my parents bought it for me for a birthday, I think, and I was immediately hooked. I still have my old VHS version of it...somewhere, but it was lost in the depths of time when when I got it on DVD. I vagely remember there being a Pizza Hut commercial before the film on it. Then I saw the sequels and became a fan of some of those, and so on and so force, you now the story. I was a bit of a dinosaur fan as a kid, especially of the "main" dinosaurs known at the time: 'brontosaurus', triceratops, Tyranosaurus, diplodocus, etc. My mom caught onto this pretty fast, and she bought book after book after computer simulation after movie about dinosaurs. I first watched the original LBT as a child, perhaps 5 or 6 years old. My Mom showed it to me for the first time. It actually didn't have very much of an impact on me at the time, but I didn't Dislike it. Enter LBT 2: My mom bought it for me soon after it came out, and I immediately fell in love with it! I must have watched it countless times, when I was between about 7 and 11 years old, and I never grew tired of it. The same went with LBT 3. I never got into LBT 3 Quite as much as a child, but I still wanted to watch it sometimes. My Mom also got me LBT 4 when it came out, as I loved the first 2 sequels. I just couldn't get into LBT 4 as much as 2 and 3 for whatever reason. I think I expected more adventure, and more time in the valley of Mists than there actually was. I guess I just expected more cool hazards and fun stuff to happen in the valley of mists, and I wasn't a fan of the "grandpa gets sick so let's find a flower to heal him" story. By the time I was 13, I basically stopped watching the LBT movies, except on very rare occasions. A few years pass where LBT has little to no effect on me, aside from the very occasional viewing. I think I watched one sequel Once between the ages of 13 and 17. When I turned 17, a turnaround came about. My girlfriend at the time and I plugged in the original LBT, because we both enjoyed it and haden't seen it for years. This rekindled my interest in the series, and I started watching the sequels 2 through 4 on VHS on a fairly regular basis. Eventually, I started surfing the Internet for LBT-related items; music, sheet music, collectibles, artwork, and forums. That led me here, novemeber of 2005. I steadily found and watched the remaining LBT sequels on DVD. I didn't particularily enjoy the Grosvenor sequels (5 onward) at first, because of the radical change in style of animation, voice actors, etc. but it eventually grew on me, and I watched them all regularily for some time. My parents took me to the theater to see the first one. I had to be about 7 since it came out in 88. Mom got the tape of the original but it was before the case type containers, it was just a box type cover (it's gone now ) The first tape wore out after a while and we had to get a new one...that was when the post office was selling them with the stamps. I recall quite a bit of the Pizza Hut thing...I once had Ducky and Spike puppets and got Littlefoot later on but the darn things got lost in moving I also had two storybooks but am down to one now. I had most of the sequels at one point but no longer do...I've thought about taping them off Cartoon Network but have never gotten around to it. I still have, I believe, 2,3 and 7 plus the sing a long. My Dad, my sister and I went to see the land before time when it was released over here in 1989. I must have been five years by that time. Funnily enough the only clear memory I still hold to that day is not of the movie itself, but to something I saw en route to the cinema. A commercial sign on a wall. The sign was in the shape of a blue and golden four-pointed star with the lower point being longer than the others points. The sign was attached to building's wall of dark grey / silvery stone. I have absolutely no idea why this star stuck to my memory rather than anything else. The movie itself must have an impression too though as in the years to come lets pretend land before time games were among the most popular games I played with my best friend back then. The cinema in which I watched LBT for the first time has been closed several years ago, but the building still exists (an issue of protection of historic monuments prevents any major changes being made on the old cinema building). The blue and golden star too is gone, but the building and the wall on which it was attached are still there. I was 16 was at my friends house who was 13 at the time his little sister had just had her bday the day befofre and had just turned 11. I stoped by me and matt had plans to go do some hikeing in the woods down by my place. But his dad had decided quite spur of the moment to take them to the theator to see this new "bluth film" Being that i was a bluth fan any ways and his dad knew it he says hey why dont you come aloong. So i did. Chances are it would have ended there but then shortly before nuumber 2 came out i read who was doing the voice oers. Noticed most were not the same people. I had already read about various things about judith barsi like how she was a ocomplished adliber and a bit of a line theif and every one loved her in the cast. So i wondered why she did not do ducky for number 2. I dug deeper. Need to remember in 93 94 the net was still a very young place. Months of searching later in every thing from telnet gofer space to aols search and meta crawler i found out that she had been murdered. At this point i re watched the original land before time while waiting for number 2 to hit the shelves. Land before time went from being a simple movie to a almost video memorial in my eyes and still remains as such today. So even if a given movies story is a bit lacking il still watch it because of that. Well, the movie came out before I was even born, so I know I didn't see it in theaters... I only have it as a recorded-tape instead of a bought one, and there's a show for toddlers on before it. My brother saw the original at a friend's house when he was maybe four or something (he was born the year LBT went into theaters), and then he recorded it or asked my parents to when it came on television. I don't remember much of seeing it the first time, except that I always laughed at Petrie, and I was sobbing when Littlefoot's mother died. I remember seeing it many more times with my brother, and apparantly I loved the series a lot, because we would always play pretend with an old "friend" of my brother's (AKA girl who would hang around with him and had a crush on him). I wanted to be Cera, but the other girl always claimed that role, so I was Ducky instead. My brother was Littlefoot and we'd always have adventures about being chased by sharpteeth and such. 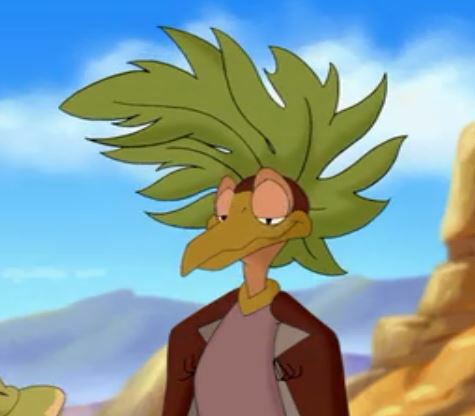 I would "talk" to Spike even though we had no one to play him, and I would sometimes make comments for Petrie. I don't remember a specific time before getting LBT 2, but I remember after that my brother would sometimes be Chomper as well, most often in a scenerio where he was older and could talk (you have no idea how thrilled he was when we got LBT 5). LBT 3 came along and there was no big change. We got the Sing-A-Long Songs and I would watch it every day until I had memorized most of the songs on it. When LBT 4 came around, I was estatic because the Apatosaurus/Brontosaurus type dinosaurs were my favorites, and I loved seeing a female one. When it came time to play pretend again, I wanted to be Ali, but my brother told me I couldn't because he was Littlefoot. I didn't understand him at the time, but after another viewing or so I did. We first watched LBT 5 at my grandmother's house, and I was singing the songs constantly (along with crying at "Always There"). We sang "Friends for Dinner" and "Big Water" in the car ride home (for two days) until my parents told us to be quiet. At this point, I was extremely obsessed. We got LBT 6 and my obsession intensified. At this point, I was expecting a new movie every year, and when 1999 rolled around and I got no LBT 7, I was disappointed. Somewhere between 6 and 7, my brother stopped playing pretend. It was understandable, as he was eleven and had friends of his own, but I was a naive little girl and wasn't good at making friends. I wasn't atheletic, so I spent my time in my imagination, playing anything with the few kids I could and using the television to cultivate my creative side. Sadly, no one I played with knew of LBT. When LBT 7 unexpectedly hit shelves, I went to get it, but a little half-heartedly. My obsession was waning, and when LBT 8 came out it took me at least a month to pick it up. I wasn't even keeping track of releases, and school work pulled me away from LBT 9, which I still have to see. I saw LBT 10 at Blockbuster one day and wanted to rent it because of the word 'Longneck' in the title. I remembered Ali, my favorite character from when I was younger, and figured she'd be in it. I was very disappointed to learn she wasn't, but pleased to find Littlefoot's mother hadn't been forgotten. I heard of LBT 11, but I was now in the dreaded Junior High School and therefore had no time to watch old children's cartoons, as I thought. By the time I could've watched it, my interest was gone, and the movies I owned, 1 through 8 and the first Sing-a-Long just sat discarded on my shelf like most of the other movies from my childhood. Well, it was actually only a week ago when I can say I got back into LBT. I admit I'd heard of the series, and I'd wikipedia-ed LBT 12 when I was bored one day (a habit of mine ever since discovering the website), but I merely sighed because I figured the series was only being milked now and had lost all the messages of the old ones, and the characters of my childhood. I was looking through the Digital Cable Guide last week (another habit of mine), and decided to see what was on Cartoon Network while I was gone. I grinned upon seeing one of the movies would be on (LBT 5, I think), and then saw the series would be before it. I shrugged and looked at the summary to find myself squealing for joy like a little child. My old obsession with Ali had paid off, because the episode that would be coming on was the one she made her re-appearance in. I set a tape and decided to see if the series was worth my time. When I got home from school and watched it, I found myself slightly disappointed, but also wanting more. I took out my old tapes and began to view them, and set another tape for the next morning. It was only by chance that I happened upon this website while searching for a place to listen to "Always There", and here I am. I'm hoping when I get enough money (ie during the summer), I can go and buy the rest of the movies and perhaps get DVDs of ones I already have. Needless to say, I'm quite obsessed with the films again, and Littlefoot's mother's death still makes me cry. I don't honestly believe any true fan of LBT can watch Littlefoots mother die and NOT cry! I still make it a personal objective to collect all the sequels spawned from the original, however I was forced to stop at #8 in the series, only becuase my mother said I was 'too old for kids movies' and now unless I get a job, I won't be able to buy anymore. I was hoping to record The Great Days of the Flyers on CN, but they showed Scooby doo instead! You can not imagine how upset I was! Oh well, enough of my useless rambling!!!! I am having SO much fun on this site!!!!!! WEEEEEEEEEEEE!!!!! I guess I'm not a "true" fan, then eh? I don't think I ever cried during that scene. I don't think I ever cried during that scene. Well, I also believe others are better at controling their emotions...me....not so much, whenever I see that scene, crying is like a refllex action for me.....it just happens! Same thing with Jana. She absolutely refuses to watch the first LBT because of that scene. She absolutely refuses to watch the first LBT because of that scene. the scene...and to me that's like watching Star wars and skiping the Lightsaber fights! When I was about 3 or 4 (1994 or 1995), My mom just brought home the land before time VHS. I remember watching it with my step sister. She thought it was okay, but nothing like me. I loved it. I even remember back then, I used to crank the volume up to max when the end credits with Diana Ross came on. I loved that song since the age of 3 and I still do. Anyways, I loved the movie so much, so when I went to a few garage sales with my mom, I stole the second one. I didn't know it was stealing at the time. Mom mailed them the $1 they were asking for the movie after I stole it. Then, it just went on from there. Every time I saw a new one, I'd ask my mom for it and she'd get it for me. Then I stopped watching them so much at the age of 7. I can't remember why. Then mom sold them at a garage sale. Some guy bought them all. Then, when I was 13, I was bored one day and searching bearshare and came accross the land before time movie. I thought "what the heck, I need a good laugh" and downloaded it. I watched it and discovered that it was pretty good, so I went out and bought it along with all the other sequals. I ripped them all to the computer and threw them away to hide them from my mom cuz I knew it wasn't normal. I just watched one a day. It was wonderful. I've been an ultimate landbeforetimelover ever since. Then, I thought there was something wrong with me and seriously went to a shrink and they said I was fine. I finally found the MIDI forums and met Novaflare there, who knew of GOF. I emailed her and she gave me the link to here. Ever since then, I've been posting here for about 3 months now and I'm totally obsessed. Actually, the real reason I wanted the land before time movies is because I wanted to see how much I could remember from 10 years ago. Surprisingly, I remembered almost every detail. I never expected to like them, I was just doing a memory test. I thought it would be a once in a lifetime opportunity to see how good I could remember stuff from such a long time ago. I could even sing along with the songs. I remember how GOOD I felt when I could remember the song "Always there" from LBT 5. It was good to hear that song again. I loved it so much. I'd have to say it's still my favorite song. I thank god every day I was bored and downloaded the LBT movies. I couldn't imagine my life without LBT now. NOTE: Please don't mention anything about piracy here. I did download the movies illegally the first time. I did go out and buy them though, so I don't see anything wrong with that. I can vaguely remember several years back (I'm talking mid 90's) watching LBT 4. However, I wasn't a real fan, and pretty soon, LBT just got shoved into the back of my mind to be forgotten forever...? I began searching CN for LBT movies all the time. When one would come on, I would record it and watch it. It was great! After recording/watching several of the movies, I stopped seeing ones I had (now this would be late '06/early '07). I was missing LBT I, II, IV, and XII. I got XII on DVD, and the rest on ebay. Ever since, I've been keeping a close eye on the progression of the series. I suppose the weirdest things about my experience with LBT are that I never got into it in my "target years," only in my teen years. Also, for the longest time of being an LBT fan, I never saw the first two. All I knew were the sequels. I went that whole while of being an LBT fan without even knowing what the first one was like. A sad case, but I eventually fixed that. EDIT: Also, I never really liked dinosaurs. I still don't. They're sorta...uninteresting to me. I dunno why. I was never into dinosaurs, I just loved littlefoot and his friends so much! They sorta became part of my family! I cannot say I disliked any of the LBT movies, nor did it take me any time to get used to them. I sorta got used to the idea of singing dinosaurs when I was 3 and it's never bothered me then, or now. I find nothing better about the sequals 2-5 than the sequals 5+ as so many do. They're all just LBT in my opinon! Let me get one thing clear though: the first one was by far the best and there is no way in H*** that any movie is going to ever be made that will surpass the quality and magic of the first one. Not gonna ever happen. I have no problem with anything LBT. I do not think that the sequals took away the "magic" from the original at all, I think they enhanced it. LBT is the best thing that's ever happened in my life and I love being a landbeforetimelover. Nothing is ever gonna change that for as long as I live. I can¥t remember exactly, but what I know is, that I looked it very often as I was a child. My parents bought me some LBT storys. I loved it (what means loved, I love it yet, too). As I grew up, I slowly forgot LBT. But than, one day it came in the TV and I remembered now again. I think I was 14 that day. What me had remembered LBT before two months, was the song Always there. I find that song wonderful. So I thought, I look these LBT story again. After that I wanted to know everything about LBT. I searched in the Internet for LBT movies and trailers and I loved it more and more. And than I asked me, if it given¥t a forum where I can discuss about LBT or where are people, whose are feeling like me. That¥s my story. And I¥m very proud about this forum.